In March we started a multi-month survey asking everyone to report when you saw your first swarm in any given county. We thought this would be a fun way to see if they came early this year after such a mild winter. In order to allow everyone to track the swarms, I provided a link to the raw data. However, I also wanted to provide a quick summary of the final results including a map that I created based on the data. The survey ran from early March through the end of April. Forty-four swarms were reported in 35 counties. Only one swarm was reported for most counties, but Boone, Carter, Fayette, Johnson, Mercer, Muhlenberg, Ohio, Shelby, and Simpson counties all had two reports for the first swarm sighted. 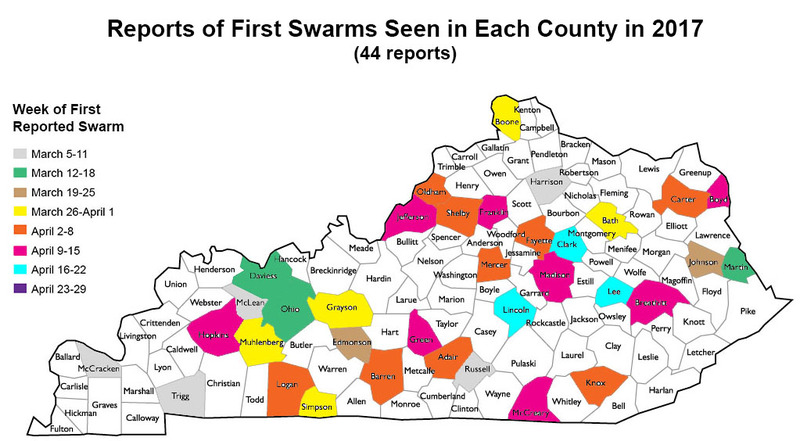 The earliest swarms reported were during the week of March 5-11, when five counties reported swarms. Numbers of “first swarms sighted” peaked between April 2 and April 15 (13 first swarms were reported for April 2-13 and 10 were reported for April 11-15). The map below shows when the first swarm was reported for each county.